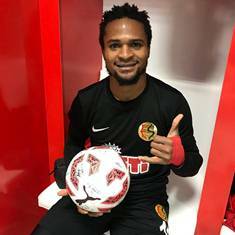 Nigerian striker Chikeluba Ofoedu scored his first career hat-trick in Eskisehirspor's 7-0 demolition of Gaziantepspor in the Turkish First League on Monday evening. Eskisehirspor coasted into a 3-0 lead at half-time, with their Nigerian star writing his name on the score-sheet in the 28th and 43rd minute. The 25-year-old then teed up Hasan Acar for his side's fourth goal before making sure he went home with the match ball when he netted his third goal of the game in the 74th minute. A delighted Ofoedu posted on the social networks : ''Special thanks to God and my teammates and fans who made it possible to get my first career hat-trick yesterday.... thanks lil bro for your three assist @h.huseyinacar4 ''. Ofoedu has been in the form of his life in recent weeks, having tallied seven goals in his last four matches, including a pair of goals against Balikesirspor and his former club Samsunspor. He has also featured for Turkish clubs Karsiyaka and 1461 Trabzon.